Palangan Village, in the mountains near the Iraq border. Palangan, illustrative of many of the country's rural settlements, has benefitted handsomely from government support. 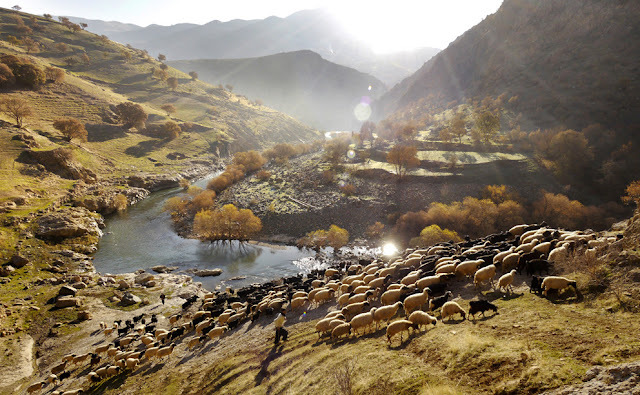 Many villagers are employed in a nearby fish farm, or are paid members of the Basij, whose remit includes prevention of "westoxification", and the preservation of everything the 1979 islamic revolution and its leader the Ayatollah Khomeini stood for, including strict rules on female clothing and male/female interaction. A shepherd leads his flock out to pasture in the mountains on the Iran/Iraq border. 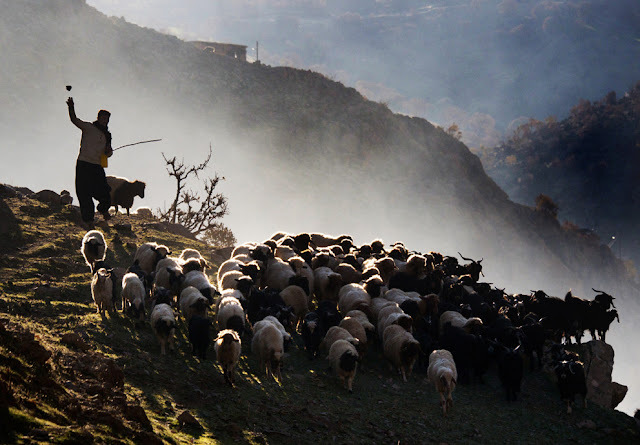 Two shepherds lead Palangan's flock of communally-owned sheep out to pasture. The government's spending in some rural regions has bought them a network of loyal followers who can be scrambled at any time to crush trouble in the urban centres. Rural Basij were used as a part of the crackdown in 2009 which resulted in the deaths of seven anti-government protestors. Azadi ("Freedom") Tower, the gateway to Tehran designed in 1966 by a then 24 year old Hossein Amanat. As a practicing Bahai'i Hossein was forced to flee Iran after the Islamist government labeled followers of the religion "unprotected infidels". He now lives in Canada. 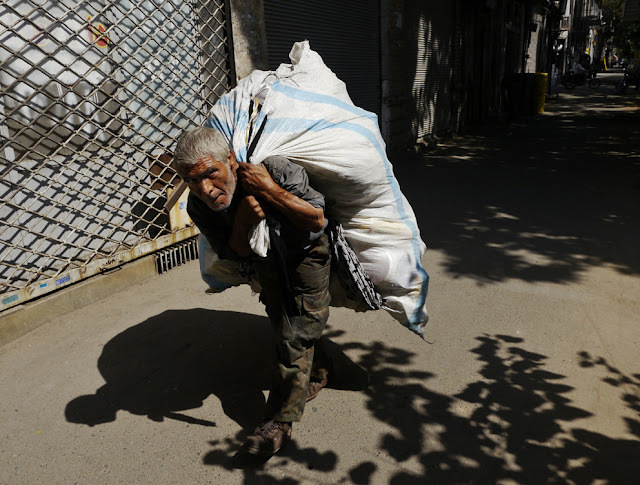 A man in southern Tehran, the working class region of the cty. In the past 14 months, tightened sanctions have nearly halved the value of Iran's currency and fuelled soaring inflation . Life is becoming drastically difficult for ordinary Iranians but many feel powerless to change the situation. Said one Tehrani "we're not naive like the Arabs to think a violent uprising will magically fix everything. We've had our revolution.. and things only got worse." 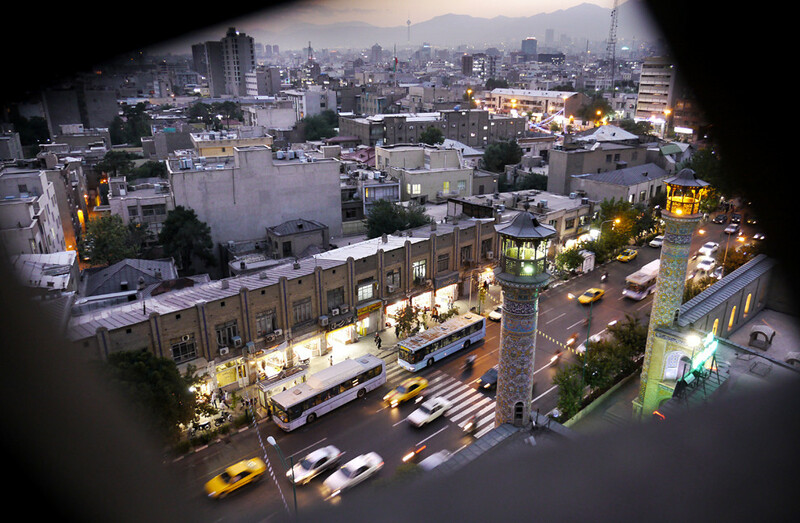 View of central Tehran from inside a minaret in Sepahsalar Mosque. 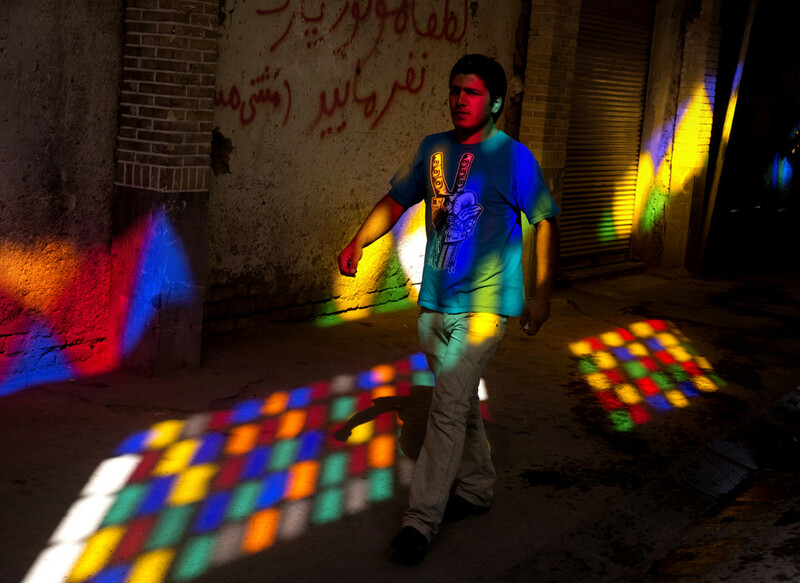 A young worker walks through the light of a stained glass window in the Tehran Bazaar. Under Khomeini Iranians were actively encouraged to produce large families. By 2009 nearly 70% of all Iranians were under 30, but the country is the least religious in the Middle East. Instead of the "armies for Islam" Khomeini had called for, the youthful population is now seen as the biggest threat to the deeply unpopular regime. 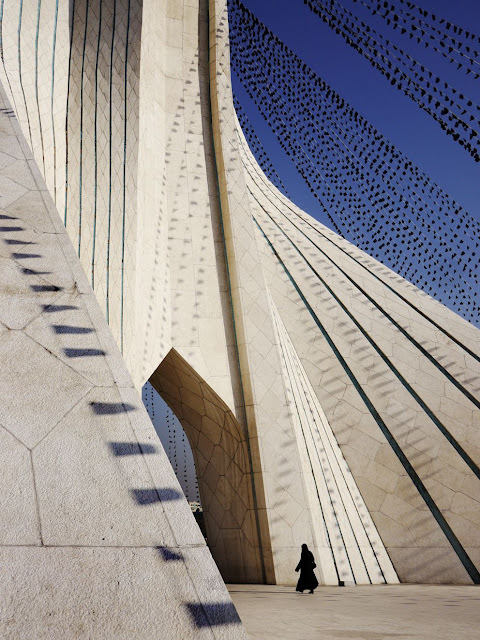 The Mausoleum of Ayatollah Khomeini in Tehran. Work on the unfinished building has dragged over 23 years. With growing economic chaos in the country, its completion is still nowhere in sight. 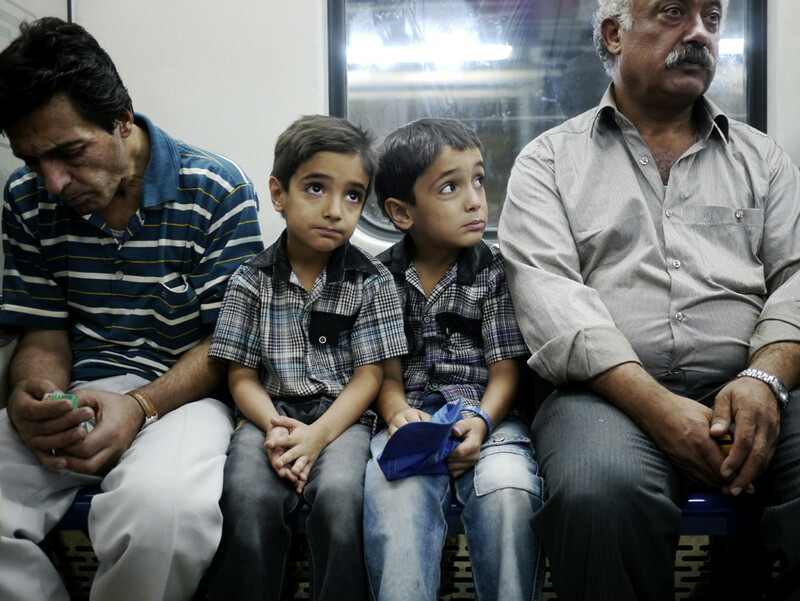 Two young twins on the Tehran Metro. 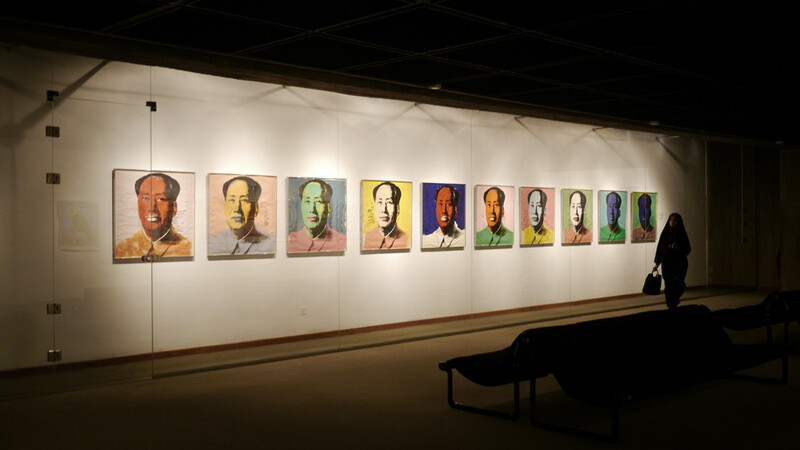 In Tehran, a collection of modern art valued at $2.5billion is held by the Museum of Contemporary Art. In a little-publicised exhibition in 2011 the works, including pieces by Warhol (pictured), Pollock, Munch, Hockney and Rothko were put on display for the first time since 1979 when the owner of the art, Queen Farah Pahlavi was forced to flee Iran with her husband, the late Shah of Iran. 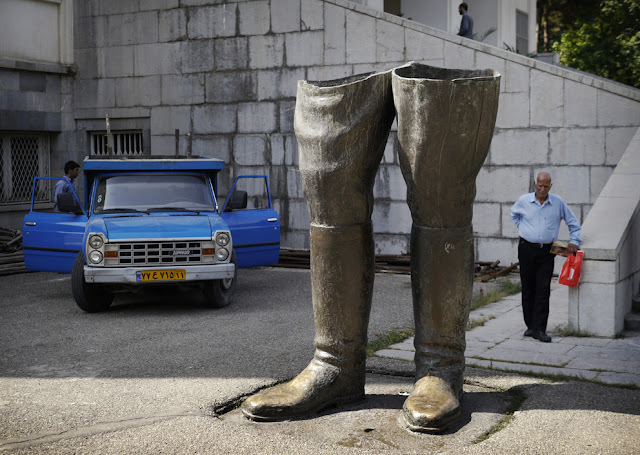 At the Sa'adabad Palace complex in northern Tehran, Islamic revolutionaries sawed a statue of the deposed Shah in half. Today schoolchildren are taken on group visits past the boots and into the palace to see the decadence of the former Shah's living quarters. Two soldiers being attacked inside the Tehran metro after an argument. The soldier was punched in the head at least four times by an angry crowd of mostly well-dressed young men. 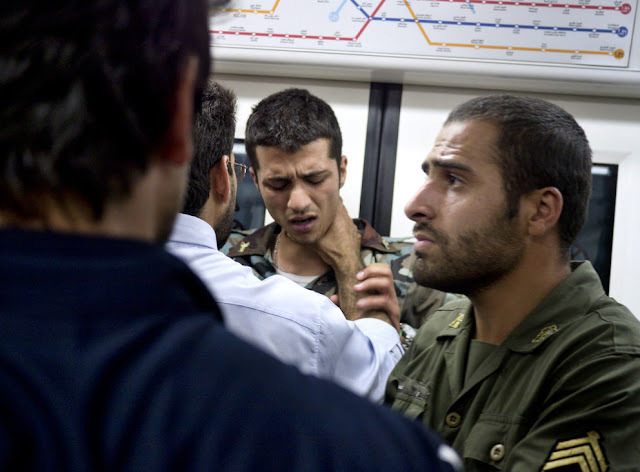 Both soldiers were forced to leave the metro at the next sation. 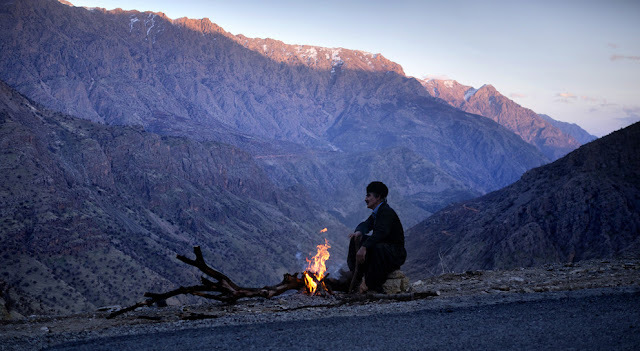 A Kurdish man settles in for a night of guarding some roadworking machinery in the mountains near the Iran/Iraq border. The border is rife with smugglers who carry alcohol from Iraq (where alcohol is legal) into the villages on the Iranian side. From there it is transported by vehicle to the cities. In Tehran a can of beer on the black market fetches around $10USD. 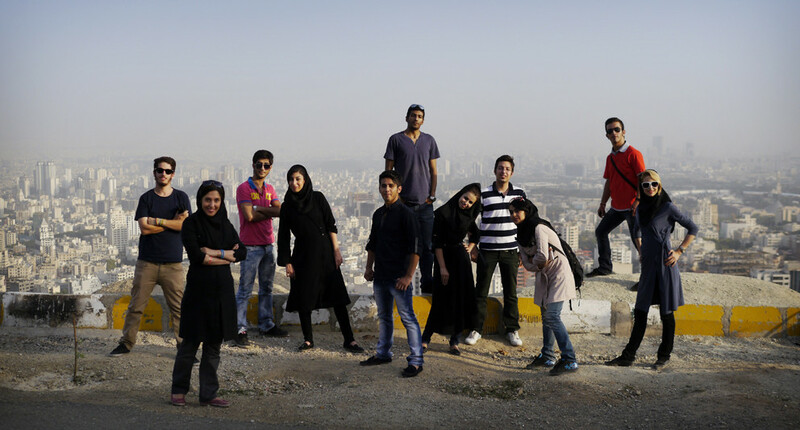 A group of friends in the hills above Tehran. Many young Iranians feel deeply embarassed by their government, and the way the nation is perceived abroad. Zac Clayton, a British cyclist who will finish a round-the-world cycle on March 23 describes Iran as having the kindest people of any country he cycled through. 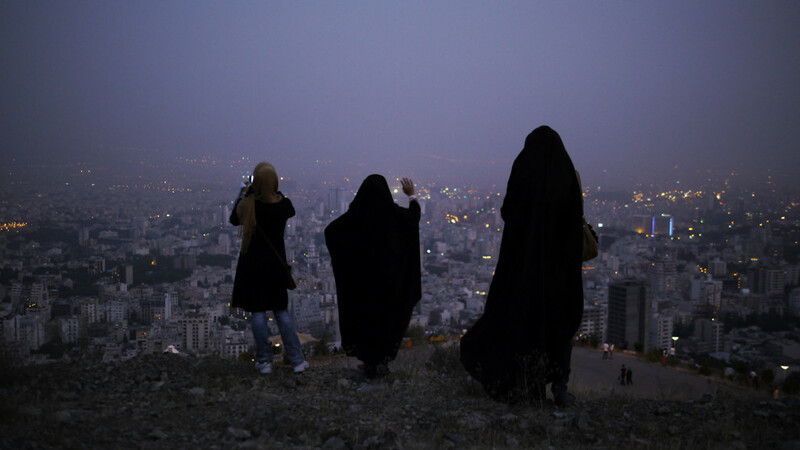 "I found most Iranians - particularly the younger generation - to be very aware of the world around them ... with a burning desire for the freedoms they feel they are being denied by an out of touch, ultra-conservative religious elite." A mural painted on the wall of the former American embassy in Tehran. 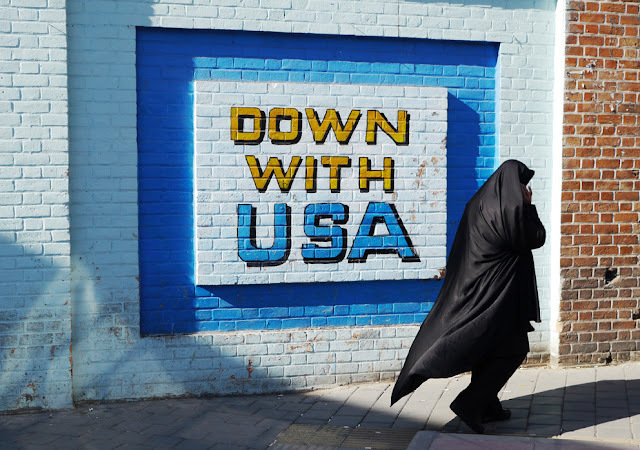 Murals such as this are at odds with statistics showing that, despite American sanctions, and the American-led coup against a elected and popular prime minister, more Iranians feel positively about America than do Turks or Indians. 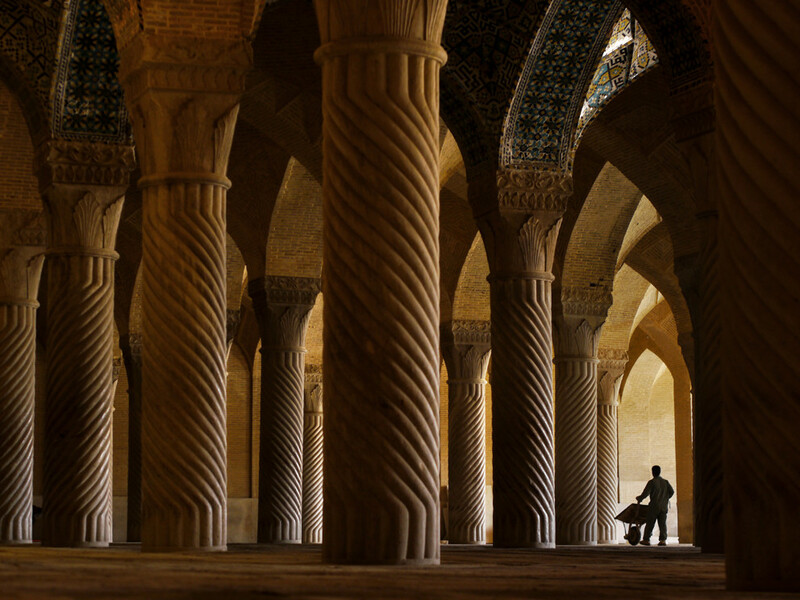 A worker inside Vakil Mosque, Shiraz. The mosque now serves as a tourist attraction but sees only a trickle of visitors. Although tourism is on the increase, western tourists still make up only 10% of the total. One tourist guide said westerners are scared away by the bloodcurdling rhetoric of a government which is completely out of touch with ordinary Iranians. 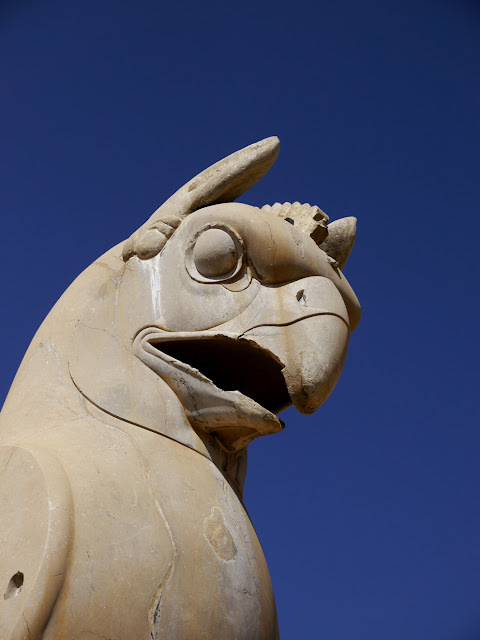 Detail of Persepolis, the seat of the Ancient Persian empire. The Arab conquest of Persia led to a an islamification of Iran but Farsi, the Iranian language, has remained alive. The 11th century poet Ferdowsi, described as "Iran's Homer", wrote an epic in Farsi which was carefully crafted with minimal Arabic influence. 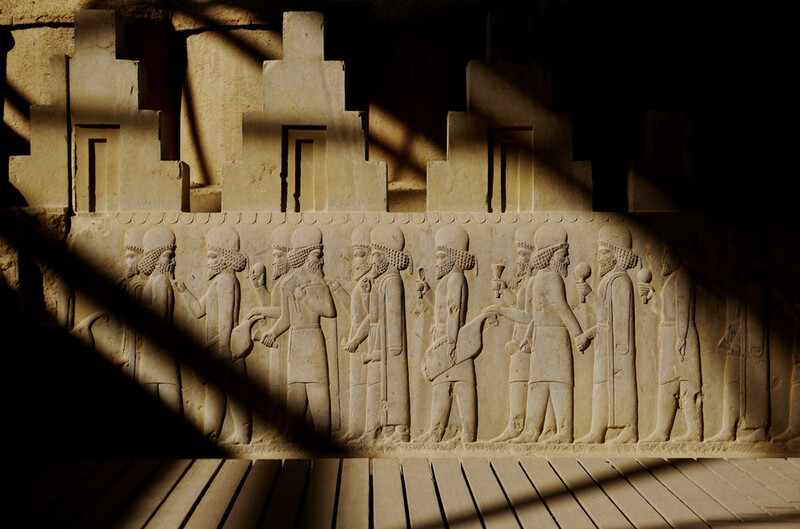 The "Book of Kings" has been credited with helping preserve the Farsi language - one of the world's oldest. The Book of Kings ends with the Arab invasion, depicted as a disaster for Persia. Detail of Persepolis. After the Islamic Revolution, hardline clerics called for the destruction of the site, but official unease prevailed. "They realized this would unite the people against them" says an English teacher named Ali, quoted in National Geographic. 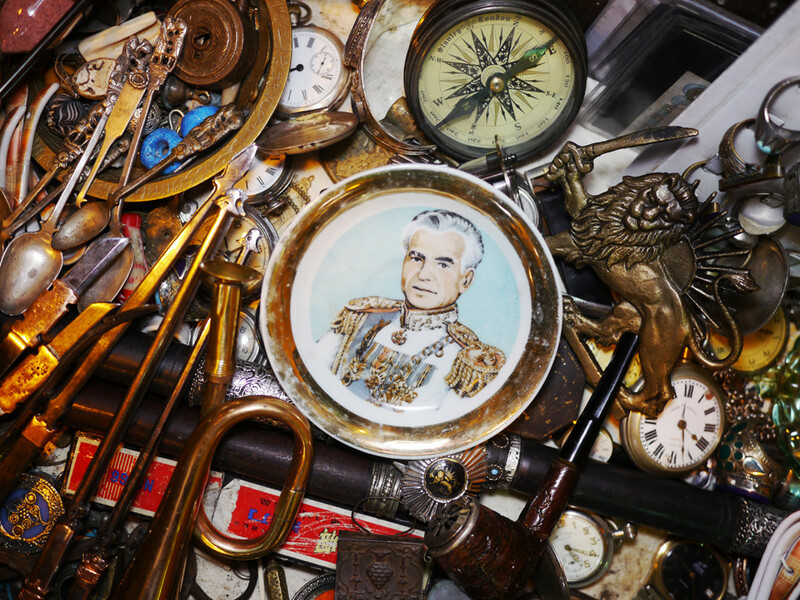 A commemorative plate of the former Shah of Iran in an antique store in Shiraz. 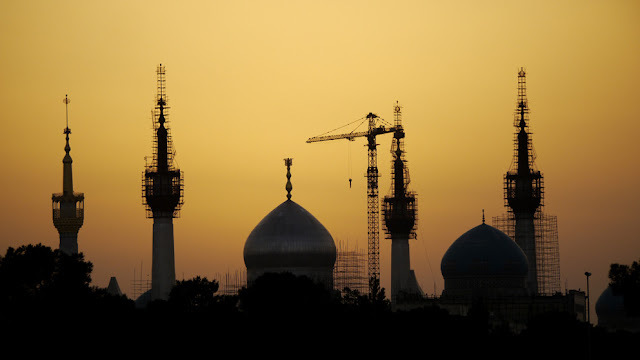 The Shah was installed in power by a MI6 and CIA-backed coup after Prime Minister Mosaddeq nationalized the petroleum industry of Iran, thus shutting out British dominance of an industry they had controlled since 1913. That Mosaddeq had been a democratically-elected leader, with wide popular support fuelled resentment at western powers, and the Shah, who many saw as a brutal puppet for the west. The anger at western intervention helped stoke support for the virulently anti-western Ayatollah Khomeini. 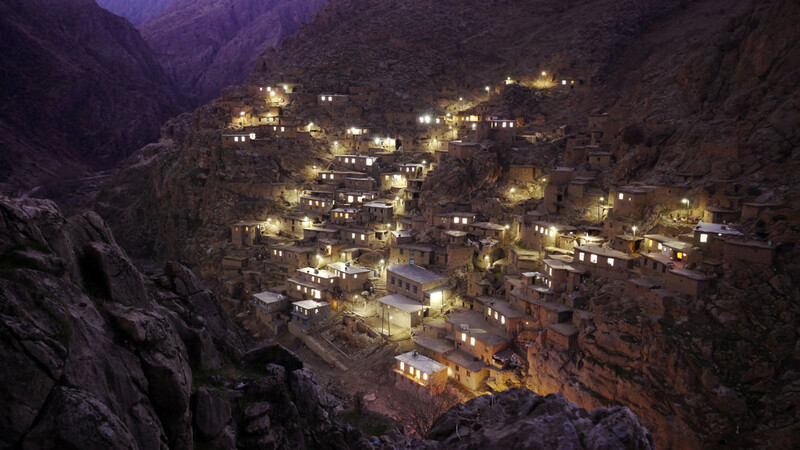 0 responses to "Glimpse into Iran with Lonely Planet Photog Amos Chapple"